An author whose new novel is set in Blacksburg, Virginia will be in town this weekend to give a talk about her book. "Pretend We Are Lovely" is the story of a family's struggles and strategies for coping with grief. 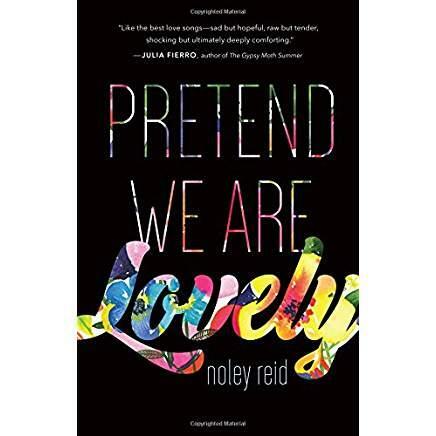 "Pretend We Are Lovely" is a story of a family in crisis. It's the summer of '82 in Blacksburg, Virginia, seven years after a young mother, Francie, has accidentally killed her young son, by running him over with her car in the family’s driveway. When the story opens, the family of four is near total collapse. But through it all, there is one consuming theme, food--- what they eat and what they don't and why. through the way the family members have decided now to eat, as a kind of reaction to his absence and his death." Reid's characters either over indulge or starve themselves. The father in the family, Tate, is a philosophy professor at Virginia Tech. Reid's own father was an economics professor there. In the story, Tate lives alone in an apartment near campus because his wife won't let him back into the family home, though he desperately wants to be there. Reid sets the scene. "He is a big man and privately indulges in ice cream and doughnuts. He keeps a well-stocked fridge. Mother Francie is absolutely the opposite. She obsesses over maintaining her thinness. who insists on keeping her thinness and sees their 2 daughters through their dysmorphic lens, when she sees them at all. Their mother's eating disorder and their father's hunger for food plays out in the lives of their two daughters; Vivvy who's 13, and like her mother, denies herself food as a way to stay in control, and Enid who's 11, and does the opposite. In this scene, the fictional characters visit a real life Blacksburg eatery. "Today daddy and I hit the donut shop; Carol Lee. The one with the street window that looks in on the squirty dough shooting into rings on a conveyor belt and flipping into dark 'goldy' oil. I get chocolate frosting on top. He goes for Boston Creme. The girl at the counter smiles at me. You can heat yours up over there she says. I know I say. I always heat it up. Throw a dozen surprises in a box-- would you please? For the girls, dad says, low, to her, to take home low, (like I shouldn't hear him,) and some friends for later he adds. " The woman at the counter is actually a love interest of Tate's, one he pushes away and pulls back as he confronts his disintegrating marriage. Reid says sure, there were disappointments to in her own family life growing up. After her parents left Blacksburg they divorced. But the years before that, while the family lived in Blacksburg was a special time in her life. Her novel also captures that feeling of exploration, safety, excitement and discovery. "This was where I was happy. This was where I had family that was happy." Like the family she depicts in her book, Reid herself, has long struggled with food. She's 5' 6" and her weight has run the gamete from a hundred and six pounds to nearly three-hundred. Literature is not meant to make a point or tell people what to think. Reid says, " I never set out when I’m writing, to impose a position on anyone, but what I see is an argument, made through the characters and their lives, that is a rejection of white western beauty standards; a standard that says 'these people belong, those people don’t.' She calls out the diet industry," spending millions of dollars, while that is so harmful to people. That is of what I hope comes through (in this book) is that, the healthiest way to approach food is to enjoy it and then forget about it." Noley Reid will be at the Festival of the Book in Charlottesville, Friday March 23 at noon as part of panel discussion on "fractured characters. She will read from her new novel and give a talk at the Blacksburg Public Library on March 25 at 2 pm. The event is free and open to the public.